David Stücken isn’t your average “rock n’ roll changed my life” kind of musician… even though that’s an actual quote of his. Singing and performing is one of his first memories, dating back to seeing Jerry Lee Lewis when he was only four years old. You could say he was pretty hooked on the concept of pursuing a career in music. Junior high was where his first garage band was formed and continued throughout high school. Fast forward a bit and you’ve got his current project, David and the Curse. 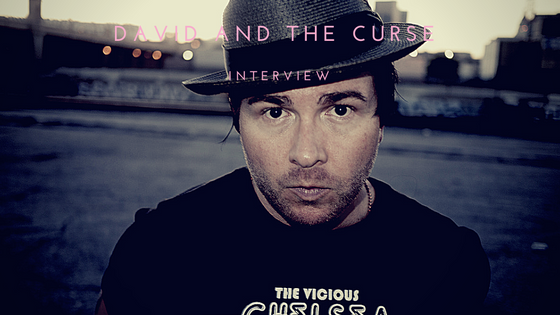 “I would say that through different musical endeavors, it’s sculpted the sound and the refinement that David and the Curse is,” he said. His influences of 60s and 70s rock are something that Stücken was always sure about. The harder aspect, however, was finding his voice. With each project that he worked on, the refinement that he spoke of gave him a clearer understanding of what he wanted his new sound to be. Stücken has never been a follower when it comes to any facet of his life. That’s why when he set out as a solo artist and ended up with bandmates once again, he went along with it based on his morals versus the right or wrong of the industry. “If you don’t have humility and respect and you don’t value the people around you, it’s very easy to fail. So even though it has my name on it, I still respect my bandmates. And like I said, becoming David and the Curse was a natural process of an evolution. I had no choice, I had no band. I had to start a new one, and it’s going to be my own this time,” he said. This time around, Stücken has a handle on what he wants to share with the world. His personal struggles and his extensive resume helped shape him into the man he is today and that’s the story he’s looking to tell.